Children’s Liturgy of the Word (CLW) is offered during the 9:00am Mass every Sunday beginning in September through May. Children currently in Kindergarten through Grade 3 are invited to participate in the Children’s Liturgy of the Word and are called to come forward before processing into the Parish Hall. CLW gives our children the opportunity to experience the Sunday Scriptures by both hearing and discussing the readings, especially the Gospel, in a manner consistent with their level of understanding. 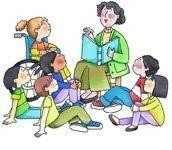 CLW is also a way of helping the children grow in their love for God’s Word. Are you looking for service opportunities in your church community? Do you like working with children? We need 1-2 teens every week. You can sign up for the Sunday(s) that best fit your schedule. Contact Sr. Judy to Volunteer.